The mighty Foreigner are taking to the road this Summer to bring you an incredible show to celebrate their 40th anniversary! Cheap Trick & Jason Bonham's Led Zeppelin Experience will also be joining them – making this one of the biggest tours of the year! You would be crazy to miss it, so be sure to book your tickets in advance and come on down to Veterans United Home Loans Amphitheater on Wednesday 26th July 2017! 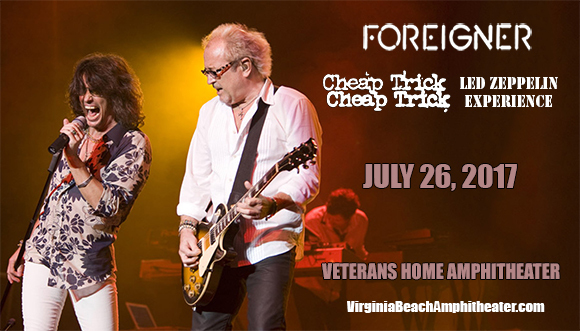 British/American rock act Foreigner are known for their hard hitting performances and epic sound. This incredible band originally formed back in the mid 1970's by the legendary Mick Jones and although they began with all of the best intentions to make it, no one could prepare them for the worldwide success they would later gain.